Note: We’re sorry, but the VA Diner Peanuts brochure is no longer available. Please see our other Order-Taker Fundraising Brochures. Virginia Diner Peanuts are known for how big and plump they are. This order-taker fundraising brochure is brought to you by Great American. With 10 flavor selections and variety of canister themes, this has something for everyone. Also, peanuts are a healthy snack with lots of protein. This will be a great choice for a Fall fundraiser, since it includes Holiday themes, plus Norman Rockwell and licensed collegiate designs on the canisters. Be sure and have your fundraiser in time for products to arrive in time to be used as Christmas gifts. Customers can do their shopping while helping your cause. 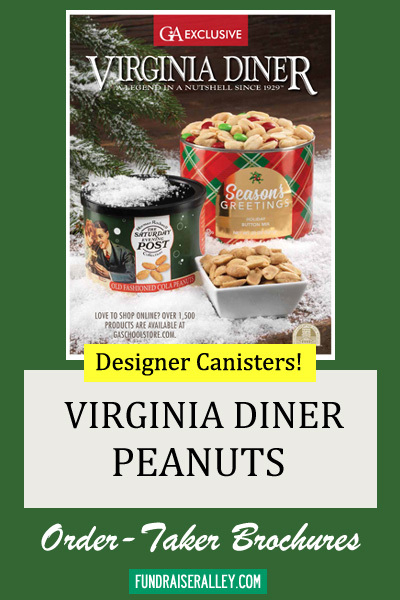 We recommend the Virginia Diner Peanuts Fundraiser for Schools, PTA/PTO, Churches, and Clubs. This colorful brochure is especially for Fall fundraising as it includes a variety of decorative canisters, including Holiday, Norman Rockwell and licensed Collegiate designs that will make great holiday gifts. 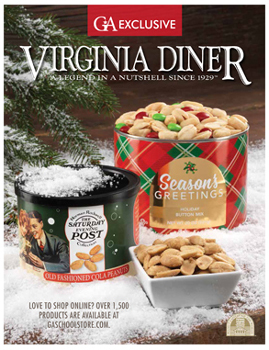 It offers 10 varieties of Virginia Diner Peanuts from regular salted peanuts to several exciting seasoning flavor choices. Virginia peanuts can’t be beat for flavor and size. How Does This Fundraiser Work? Call (1-866-826-0944) to order 1 FREE brochure per fundraising participant. Participants collect orders and payment from friends and family. You place the final order for the products. All items will be shipped to you. Distribute to your participants to deliver to customers. You have several options of payment, including major credit card, Pay Pal, or School Purchase Order. If you are paying by mail, you can also use a check, money order, or certified check. 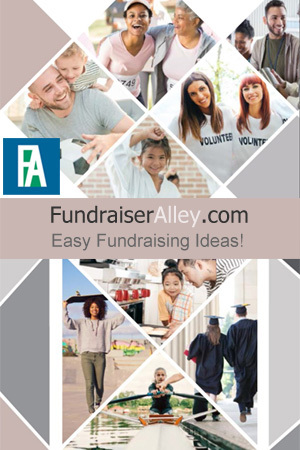 If you are interested in finding out more information about the products offered on this site, be sure and request a Free Fundraising Info Guide today.